Take a look and read about some of our recent test passes. Congratulations to Ben Gregory from Marple on passing your driving test on his first attempt Ben was learning to drive with Instructor Julian Pursglove and Passed His practical test at the Hyde Driving test Centre. Ben passed with with just 3 driving faults. Well done. 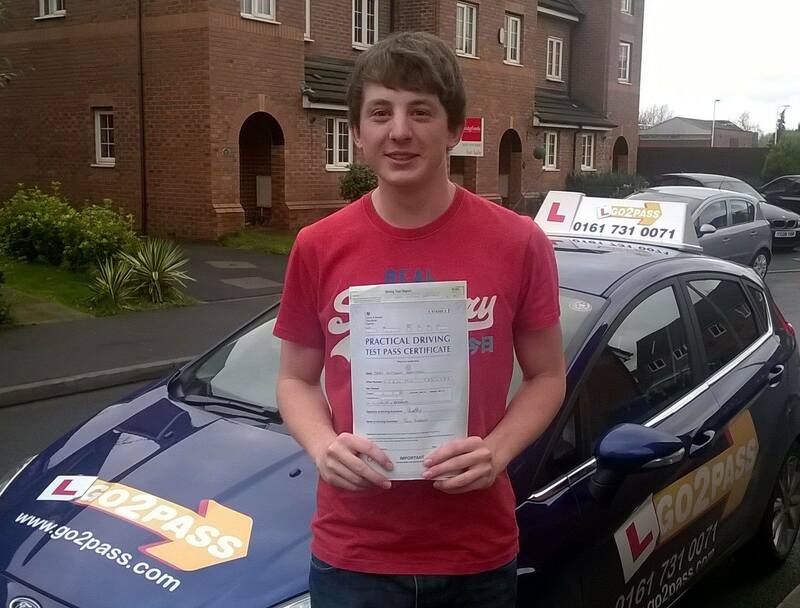 Congratulations to Benjamin Brandrett from Manchester on passing his driving test on his first attempt. Ben was learning to drive with our driving Instructor Philip Lamplugh. 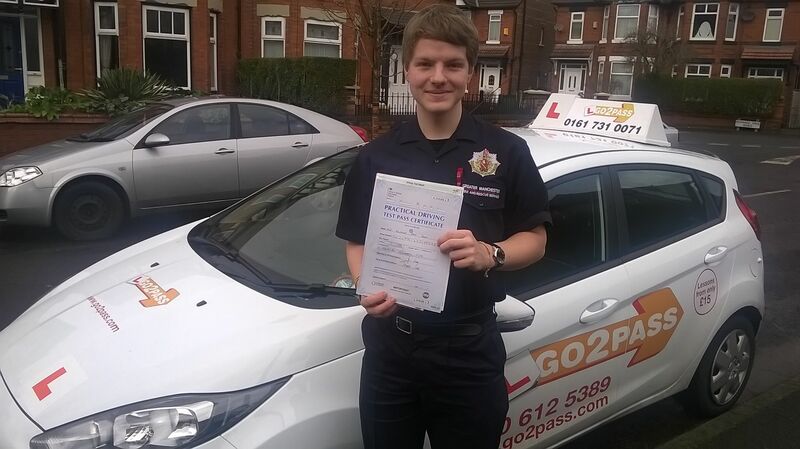 Ben passed his driving test on the 20th of April at the Cheetham Hill driving test centre. Ben passed With only ONE driving fault – an amazing result keep up the good driving Ben! 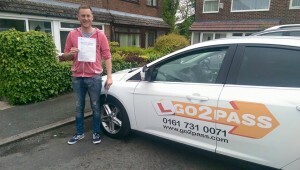 All the best from your driving instructor Philip and us all here at Go 2 Pass Manchester. The driving tuition days are over for Fergal Brady, but the learning doesn’t stop there as the roads are a harsh mistress, with ever increasingly more compelling lessons to teach! The real learning starts now; when there’s no second foot to rely on to come down on the pedal and come to rescue your unwise decision! Well done to you and your instructor, Julian for being excellent business partners; a win for both parties. Take care from all of us at Go 2 Pass. Congratulations to Katie Furber from Stockport on passing her driving test first time at Bredbury Test Centre. 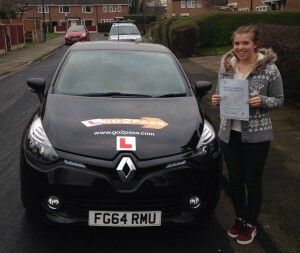 Katie was learning to drive with our driving instructor Paul Owen. According to Paul it was a well deserved pass. Safe driving and best wishes from Instructor Paul us all at Go 2 Pass Manchester. Please have your commendations, congratulations, compliments and considerations at the ready! This level of praise is payble to a certain Sean Hermitage if you see him; probably down at the pub. Or you might want to buy this seasoned young chap a a drink, as he is now fully licenced to drive (though not under the influence so if you do; be sure to order him a taxi later on in the evening!) 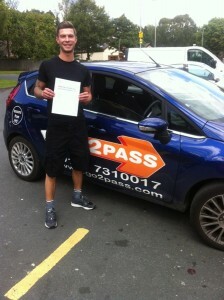 All the best Sean from your instructor Julian and the rest of the team here at Go 2 Pass. 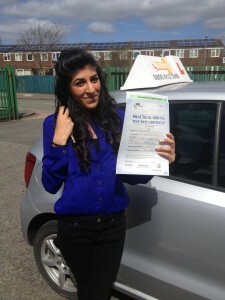 Hip hip hooray, it’s a first time pass for our brand new driver, Evette Murray! Evette was the beneficiary of one of our intensive driving courses as prompted by her employer to get her on the road fast! 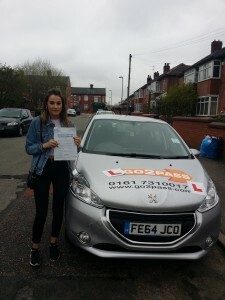 She began cautiously but thanks to her instructor was building courage every day and eventually delivered the goods at the West Didsbury test centre – and with only two minors! A great effort indeed. 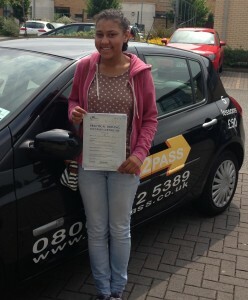 Well done from Zahara and everyone else at Go 2 Pass. It’s a ‘good riddance’ to Gemma Dunn! 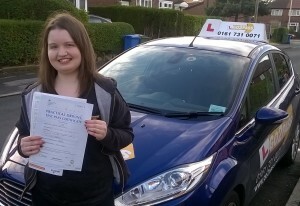 Seriously – since she no longer needs driving lessons – as demonstrated on Monday when she passed her test first time at the Bredbury centre! 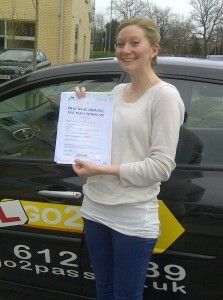 Congratulations and may she have plenty new licence holder inspired roadtrips ahead of her. Thanks for learning with us, all the best, Julian and the team at Go 2 Pass. Congratulations to Darren Coles on passing his practical driving test on 02/10/2015 on first attempt at the Bury centre. 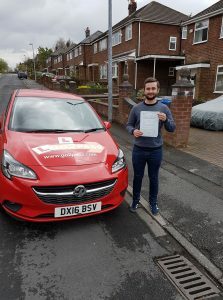 He was learning to drive with our instructor, Dale Mouhlen who provided a friendly and comprehensive introduction to driving which Darren has reassuringly taken onboard – proven by his excellent result! Once again, superb effort from the both of you. Best wishes from Dale and all of us here at Go 2 Pass. 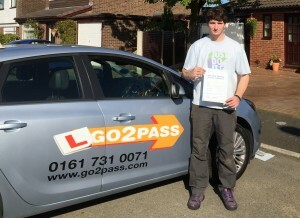 Well done to Scott from Withington on passing his test at the West Didsbury centre. Scott was transformed from zero to hero by his instructor who turned this novice learner caterpillar into an extremely capable butterfly driver. No more need to dash for the bus as now you are granted the miracle of not wings – but wheels! Or at least the miracle of being qualified to use vehicles that utilize them; as for acquiring a car, you’re on your own with that one. Best of luck in all your endeavours, Scott, from everyone here at Go 2 Pass. Now that’s the stance of a Champion! 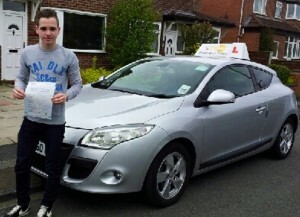 Congratulations to Jake from Middleton on passing his practical driving test at the Failsworth test centre. Jake was a particularly courteous driver, letting other drivers pass through at every opportunity. This is the kind of attitude all drivers should adopt; if only! 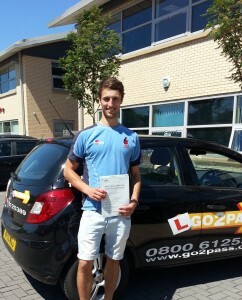 Take care, Jake from your instructor, Jon and the rest of the team here at Go 2 Pass. Joshua Ralston, congratulations! He passed his driving test on 22/09/2015 so well done to him. And he did this on first attempt so good going. Also lest not to mention the excellent effort put in by your instructor, Julian who helped him progress all the way from square one. Well done from Julian and the entire team here at Go 2 Pass. 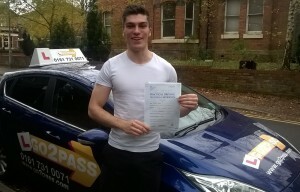 Congratulations to Darren Cudahy another first time practical driving test pass for both instructor Dale and his pupil. 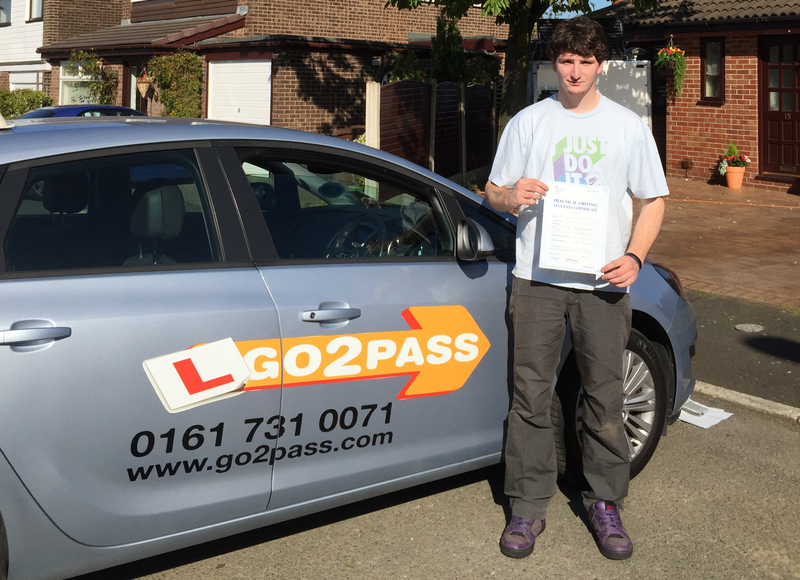 Darren passed his practical driving test on his first attempt at the Salford test centre on the 18th of September 2015. 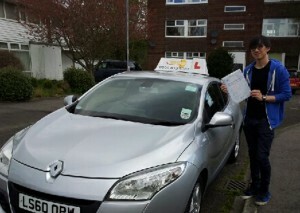 Darren passed with driving instructor Dale. All the best Darren from Dale and the rest of the team. 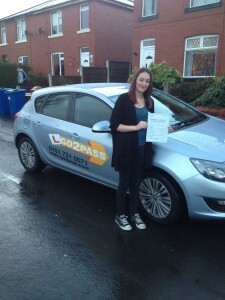 Well done to Ellie Mead from Marple on passing her driving test on her first attempt. 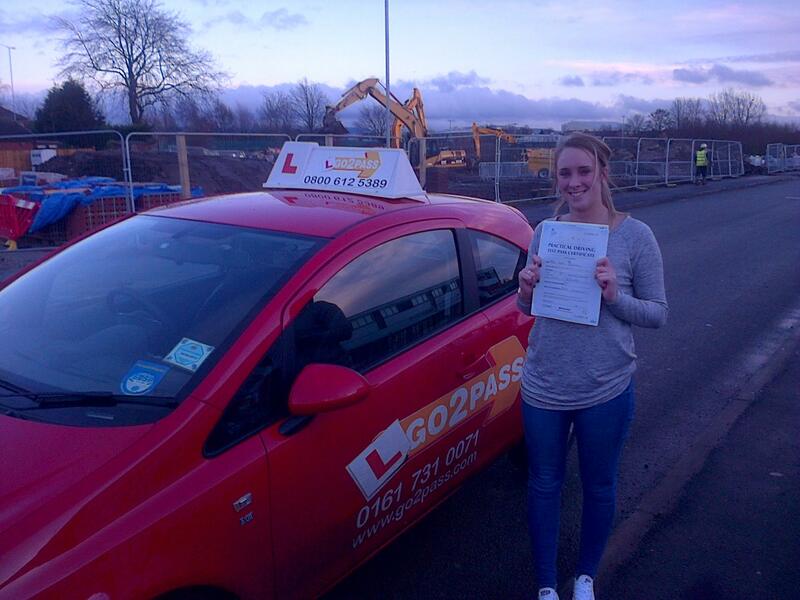 Ellie took her practical driving test at the Bredbury driving test centre on the 4th Of September 2015 – needless to say another very happy customer. All the best Ellie, from Julian and all of us here at Go 2 Pass driving school. 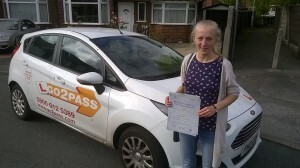 Many congratulations to Joanne Biddle from Chorlton Manchester on passing her practical driving test on her first attempt on the 27th of August at the west Didsbury test centre, Jo performed superbly and passed with just 2 driver faults- fantastic result Jo you should be very proud! Many congratulations to trainee account Naomi Cheng from Manchester City Centre on passing her driving test on her first attempt after taking a 30 Hour intensive course. 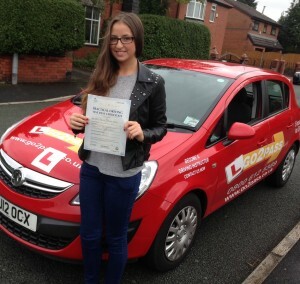 She passed her practical driving test at the west Didsbury test Centre on the 24th of August 2015. Lucky Naiomi is getting a brand New V.W Golf from work. Nice new car – i’m sure you will love driving it! All the best from your driving instructor and all the team here at Go 2 Pass. Congratualtions Joana from Didsbury for getting a first time pass on her practical test on the 24th/8/2015. She was learning to drive with instructor, Jon Murphy who taught her all there is to know. Her Dad was made up with her achievement who looks forward to seeing her become more independent. Take care, Joana from Jon and everyone else here at Go 2 Pass. 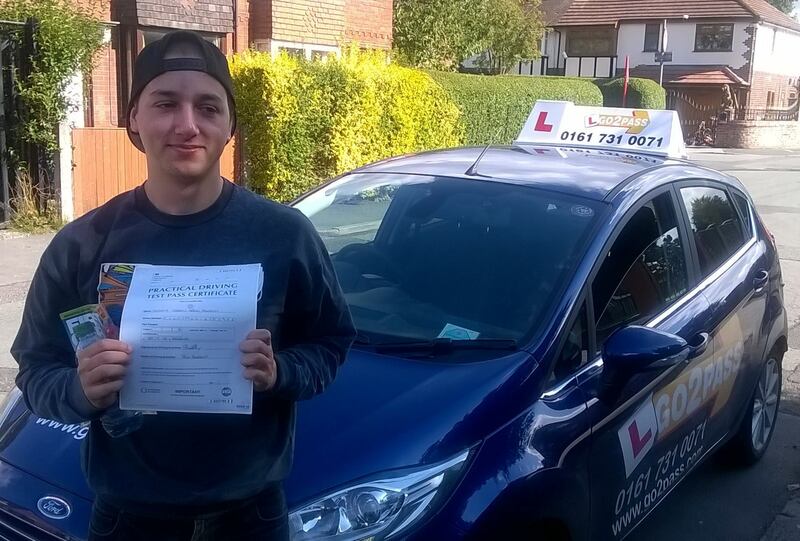 A well deserved first time pass this time goes to James Burton from Didbury who passed on the 20th August at the West Didsbury test centre, James was learning to drive with our driving instructor Arif, well done James! stay safe on the roads! 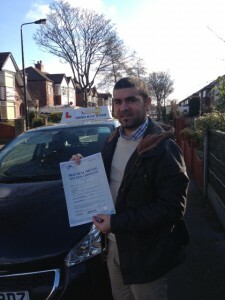 Congratulations to Yusaf Mengra from Manchester who passed his practical driving test on the 23rd of July 2015 at the West Didsbury driving test centre. Yusaf was learning to drive with our driving instructor Imran and was very pleased at having passed his practical test on his first attempt. Stay safe on the roads and all the best Yusaf from all the team here at Go 2 Pass. 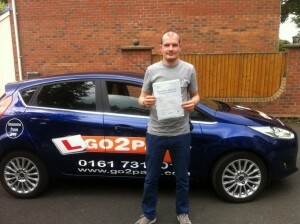 Many congratulations to Daz from Manchester who passed his driving test recently at the Failsworth driving test centre. 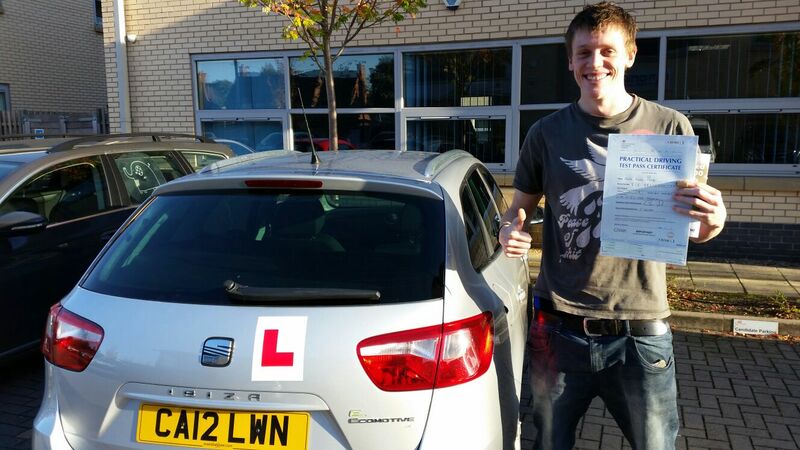 Daz was learning to drive with our driving instructor Jon Murphy and passed his driving test on his first attempt. even though he was very nervous at first he drove superbly and passed with just a few driving faults what an awesome result – well done you! All the best from driving instructor Jon and all the team here at Go 2 Pass driving school. 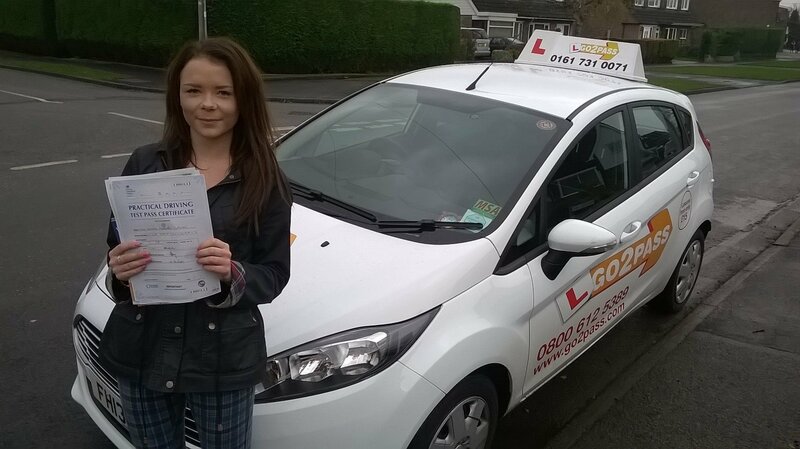 Many congrats goes to our driving instructor Royan Edward’s pupil Ciara Duggan from Manchester, according to Royan she was such a great leaner to teach- needless to say she passed her practical driving test on her first attempt with him – Royan was expecting nothing less and was ever so proud! Well done – you will be missed! 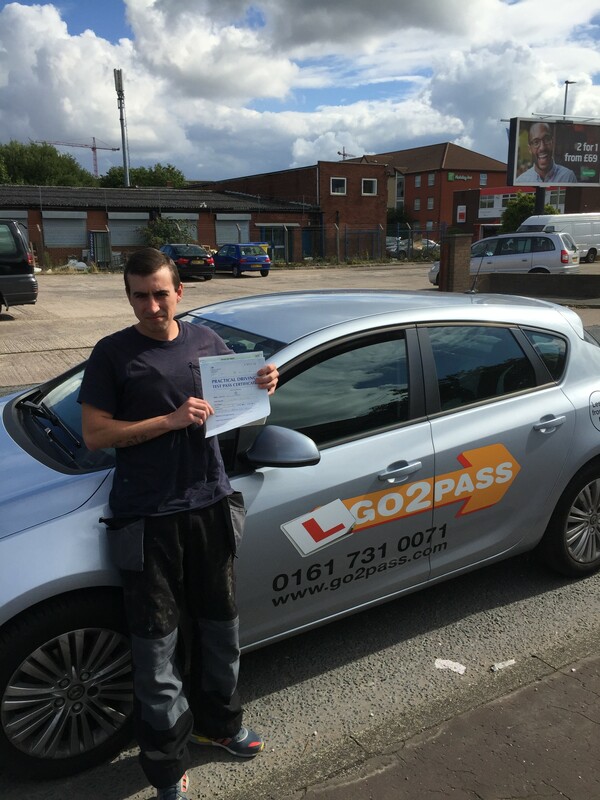 All the best from your driving instructor Royan and all the team here at Go 2 Pass Manchester. Congratulations are in order to Hollie Arnfield from Bredbury who passed her driving test with the help of our driving instructor Julian Pursglove and passed at Bredbury driving test centre at the first attempt of course with only 4 driving faults. 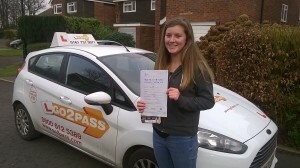 Safe driving Hollie.All the best form your driving instructor Julian and all the team here at Go 2 Pass. A massive well done to Andy Brett from Denton who passed his driving test at the Failsworth driving test centre, all our learners seem to be passing first time and Andy was another no exception – he also passed on his first attempt! Andy was learning to drive with driving instructor Nicola Malloy. All the Go 2 Pass team wish Andy the best for his future. Stay safe on the roads! congratulations goes to Michael Dunn from Burnage who passed his practical driving test on the 25th of february at the Bredbury Driving test centre, Michael was learning to drive with instructor Julian, well done and all the best from your driving instructor Julian and all the team here at Go 2 Pass. Congratulations to Alison Waltham on passing her driving test on the 11 of February at the Cheetham Hill driving test centre. Alison was learning to drive with our Driving instructor Phil. A big congratulations to Pippa Walker from Davenport on passing her driving test on her first attempt at the Bredbury driving test centre on the the 7th of February. Pippa was learning to drive with driving instructor Julian. 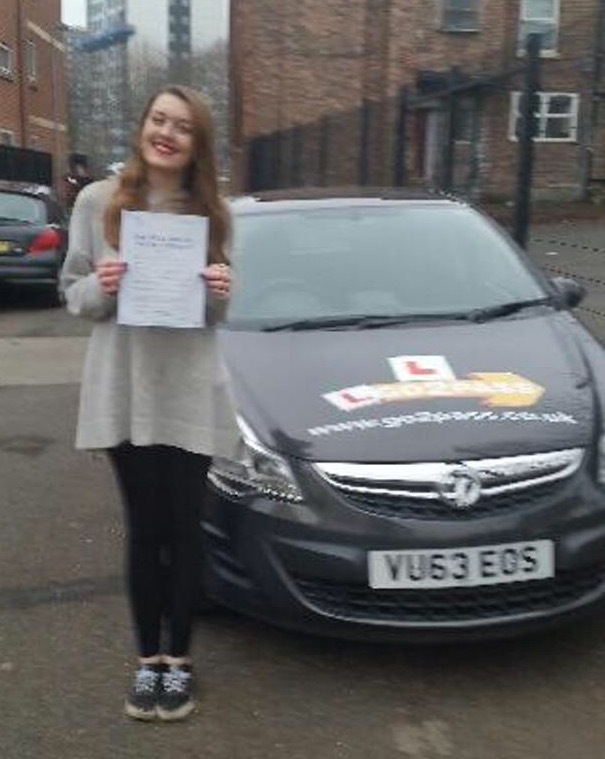 Well done to Leah Bradshaw from Moston on passing her driving test on her first attempt on the 13th of January.Leah passed her driving test at the Failsworth DTC, she was learning to drive with instructor Les Brogden. Many congratulations to Gurpal Singh from Salford who passed her driving test on her first attempt on the 6th of january. Gurpal was learning to drive with driving instructor Tanweer. congratulations to Danny Reddy from Chorlton who passed his practical driving test on the 5th of January at the west Didsbury driving test centre, Rachael passed on his first attempt and was learning to drive with instructor Julian. A big well done to Hannah Christey from Hazel Grove on passing her driving test on her first attempt at the Bredbury driving test centre, Hannah was learning to drive with instructor Julian Pursglove and passed on the 13 of December. 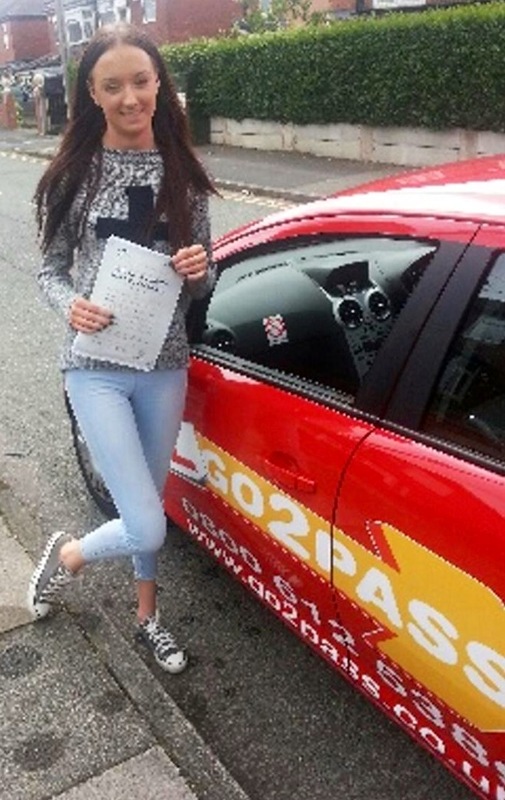 All the best for the future from us all here at Go 2 Pass driving school. 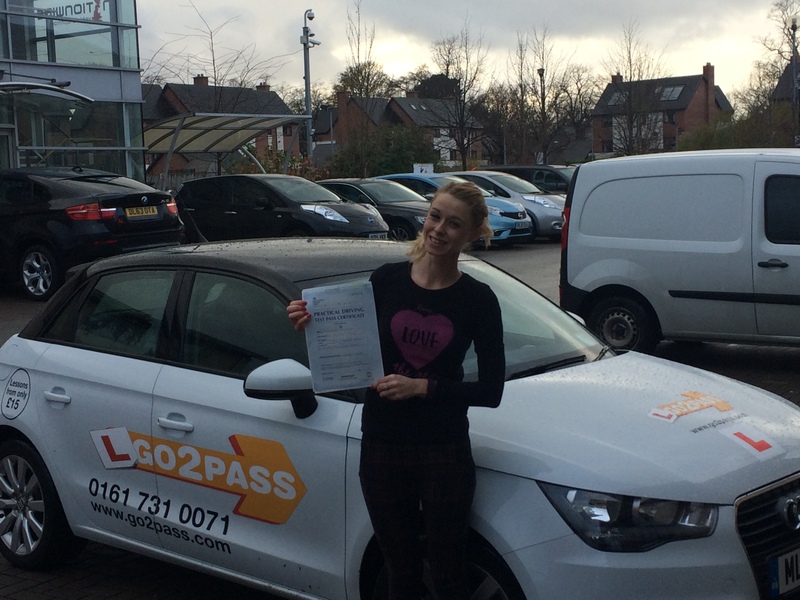 Congratulations to Beth Powell from Manchester on passing her driving test on her first attempt on the 13th of December at the Didsbury driving test centre, Beth was learning to drive with Zahara. Congratulations to Charlotte Mee on Passing her driving test with o drivier faults on the 1st of December, what a fantastic result! well done. Many congratulations to Valentine Ferguson on passing his driving test on his first attempt with driving instructor Dale Mouhlen. Valentine passed at the Bolton driving test centre on the 13th Of November. 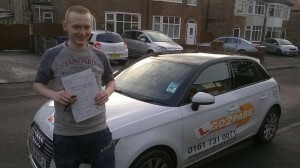 Congratulation to Liam Jones who Lives in Fallowfield on passing his driving test on his first attempt. 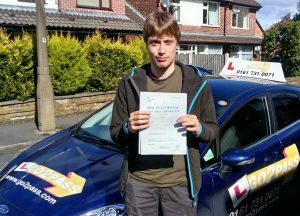 Liam was learning to drive with our driving instructor Faz and passed on the 13th of November at the west Didsbury test centre. congratulations to Sam McComiskey from Marple who has passed his driving test today at the Bredbury DTC on the 23rd of October. Sam passed his practical driving test on his first attempt. Sam was leraning to drive with our driving instructor Julian. 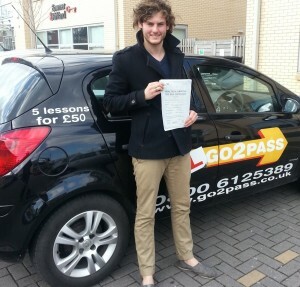 all the best Sam from your Driving instructor Julian and us all here at Go 2 Pass. Many congratulation to Lizzy Apsley from Marple who passed her driving test on the 15th of October at the Bredbury driving test centre Lizzy passed with just 2 driving faults and was learning to drive with our driving instructor Julian Pursglove. Congratulations to Shannon Henry from Moston on Passing your driving test, Good luck with the nursing course at uni and your future career. 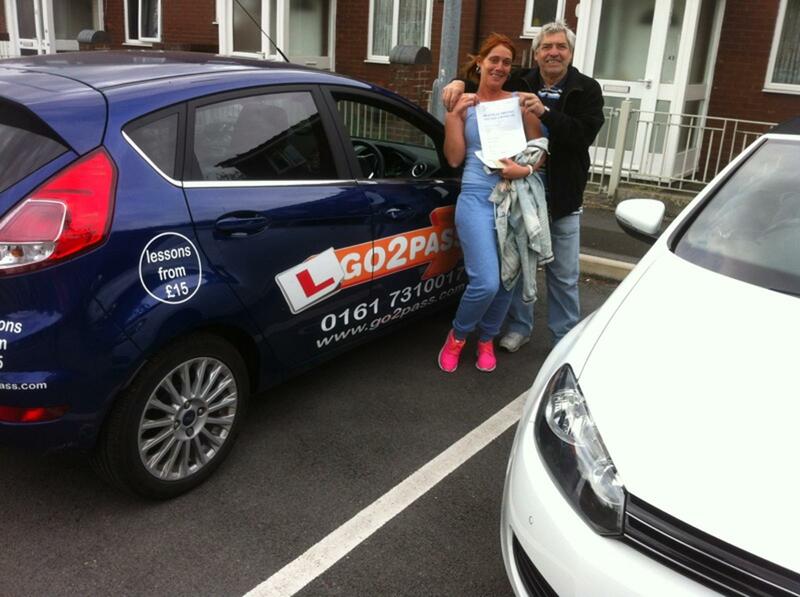 All the best from driving instructor Phill and all the team here at Go 2 Pass driving school. 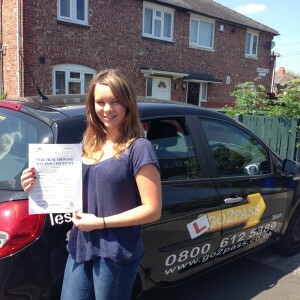 Passed on the first attempt at the west didsbury test centre on the 1st of August Rachel Shallcross, Urmston Manchester. 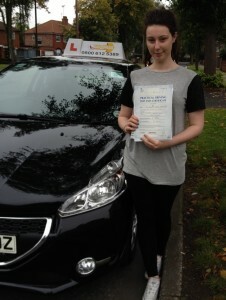 Congratulations Rachel Shall cross of Urmston on Passing her driving test, Rachel learnt to drive with driving instructor Ken, Rachel drove superbly and passed with just 2 minors. Well done on your well deserved full license. Good luck for the future from us all here at Go 2 Pass driving school. 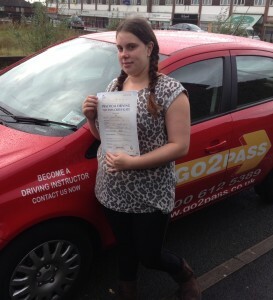 Passed on her first attempt on the 3rd of October at the Failsworth test Centre.Jordanne Sarsfield, Newton Heath. Well done to Jordanne sarsfield from Newton Heath Manchester who passed her Practical driving test on her first attempt at the Failsworth driving test center on the 2end of October. 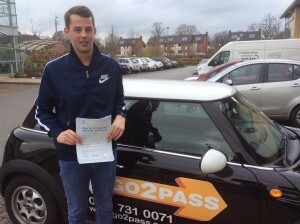 Good job and enjoy your new found free dome and good luck for the future from driving your instructor Phillip and all the team here at Go 2 Pass driving school. Passed on the first attempt at the west Didsbury test Centre.Celmentine F, Fallowfield Clementine is a student, and lives in the fallowfield area, she has graduated from the the University of Manchester. She will be going back home to Somerset, and her driving license will come in very handy. All the very best from your driving instructor and all the staff here at Go 2 Pass driving school. Passed on the first attempt at the Didsbury test center. 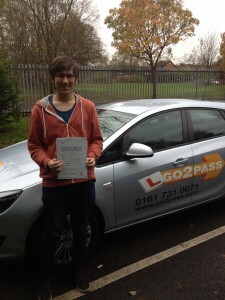 Congratulations to Daniel Watt from Fallowfield who passed his driving test on his first attempt, Daniel completed a 25 hour intensive driving course with driving instructor Tanweer, and was very glad to have done so because he has just graduated and the driving license will come in handy for his job. again well done and all the very best for the future. 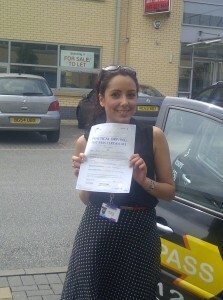 Passed on her first attempt at Didsbury test centre. 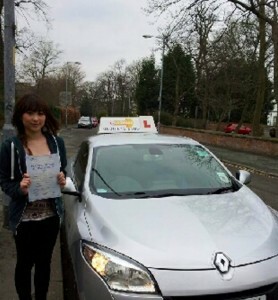 Congratulations to Jessica Paito from Manchester, who passed her driving test on her first attempt. Jessica has just fished her A levels and is going to Liverpool university in September, she now needs to persuade her mum to buy her a car which will come in very handy. 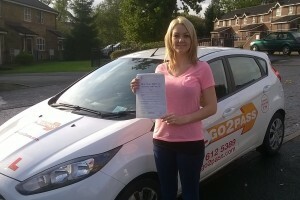 All the very best with the University course and the future from your driving instructor and all the team at Go 2 Pass. Passed on the first attempt at the Cheetham Hill test center. 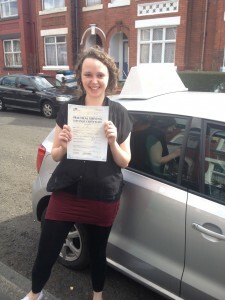 Congratulations to Lisa Porter, Lisa Passed at the Cheetham hill practical driving test center. 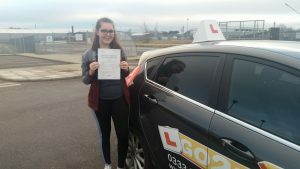 Lisa who is a student nurse from Manchester university was very pleased to have passed her test, being a nurse a driving license will come in very handy! 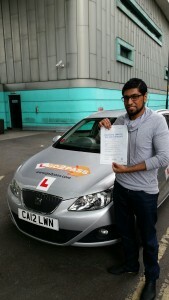 All the very best from your driving instructor Nassem and all the team her at Go 2 Pass driving school. 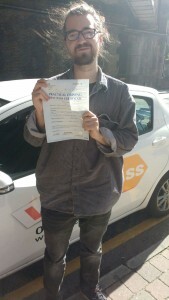 Passed on his second attempt at the Didsbury test center. 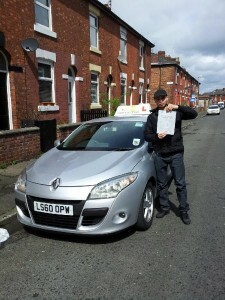 Congratulations Andy from Victoria Park Manchester on passing your driving test on your first attempt. All the very best with your university course and the futre, happy car hunting. Passed on her first attempt at the Cheetham Hill test center. Well done to Anna Macintosh on pssing your test on the first attempt, you drove really well, and it was a well deserved pass. 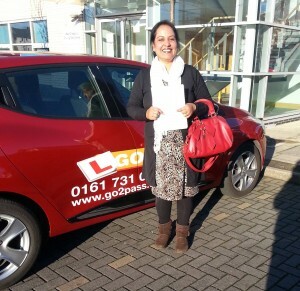 all the very best from driving instructor Tanweer and all the team her at Go 2 pass. Passed on her First attempt at theDidsbury test centre. Congratulations Sanaz on passing your test, Sanaz who lives in Manchester city Center drove exceptionally well, she hates walking and catching buses every day to work, she can now drive her Vauxhall Astra that has been waiting for her. well done and all the very best for the future. Passed on her first attempt at the Didsbury test Center. Well done to Julia Drogner from Fallowfield on passing her test on her first attempt, she will be going out car hunting with her mum and dad. 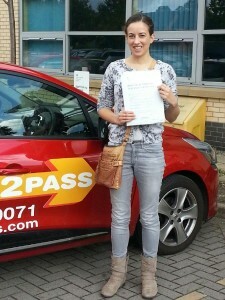 all the very best for the future from your driving instructor and all the team here at Go 2 pass. Passed on her first attempt at the Didsbury test centre. 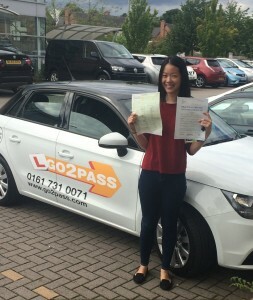 congratulations to Kristy Ho from Victoria Park Manchester on passing her driving test on the first attempt, all the very best with your course at Manchester university and the future from your driving instructor and the team here at Go 2 Pass. Passed on her first attempt at the Bury test centre. 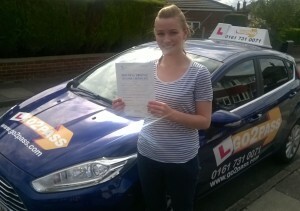 congratulations to Jodie Malvern from Prestwich on passing her driving test on her first attempt, she drove really well. in the words of the examiner, “You drove really well and you used your common sense and it was nice to see you were forward planning in your driving” Well done Joide and all the very best for the futre. Passed on her first attempt at the Cheetham hill test centre. 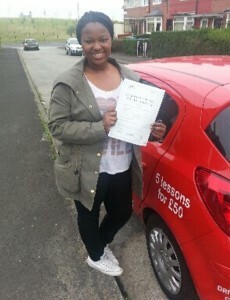 Well done Rejoice Dekeya from Prestwich on passing her test on the first attempt. all the best from your driving instructor Phill and all the team here at Go 2 Pass. 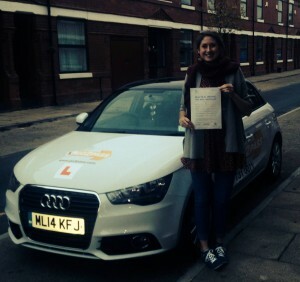 Passed at the Cheetham Hill test center on her first attempt. Welldone to Atika Anwar from Trafford on Passing your test on the first attempt, all the best from Driving instructor Naseem and all the team here at Go 2 pass driving school. Passed on his first attempt at the Sale test center. Congratulations to Dilan Shepherd from Wythenshawe on passing his test on the first attempt all the best for the future from Instructor Petrov and the team here at Go 2 pass. Passed on her second attempt at the Didsbury driving test center. Congratulations Alex Moran from Didsbury on passing your driving test, although a little nervoius you pulled through and passed. 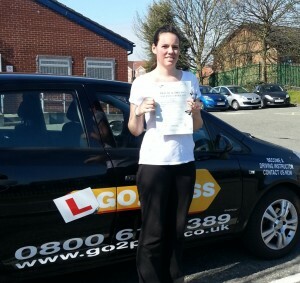 all the very best for you driving instructor and the team here at Go 2 Pass driving school. Passed on his first attempt at the Cheetham hill test center. 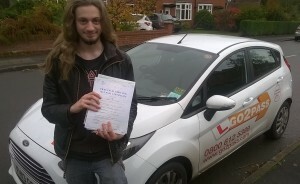 <div Passed on his first attempt at the Didsbury driving test centre. 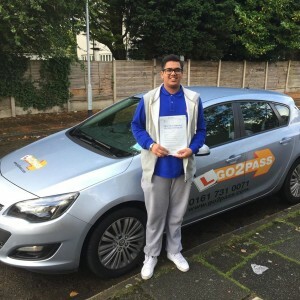 Well done to Dia Addin from Chorlton who passed his driving test on his first attempt, all the best from driving instructor Ken and the team here at Go 2 Pass driving school. Passed on his first attempt at the sale driving test centre. Congratulations to Ken from Cheadle who Passed his test with driving instructor Petrov on his first attempt, Ken was a 2smashing little driver” according to petrov, good luck from your instructor and the team here at Go 2 pass.